What interesting YouTubes have you watched? 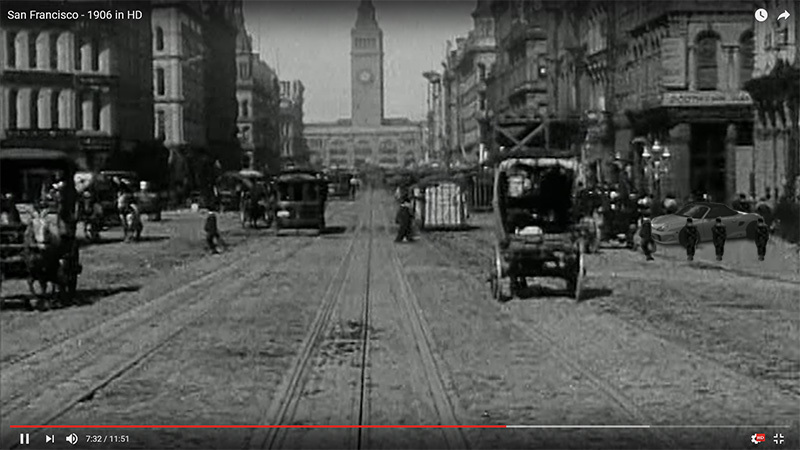 Here is one from 1906 just before the San Francisco earthquake, a trip down Market Street. It was shot with a brand new technology, 16 mm camera mounted to the front of a cable car. This copy has been digitally remastered. About 4 to 5 days later the great San Francisco earthquake hit and most of what is seen on this film was destroyed. The mix of mechanized, horse drawn, and pedestrian traffic is amazing to watch. This was a very early promotional video, watch license plates, the same cars were hired to drive circles around the camera, and a guy on a white horse does the same. Last edited by Luccia at Pelican Parts; 10-03-2017 at 08:27 AM. Amazing!! Thanks for posting this. Here's another clip, this guy may have gotten his start patching together Boxsters, who knows? Last edited by Luccia at Pelican Parts; 10-03-2017 at 08:31 AM.